Niki Mahajan a designer with panache has devoted the last 15 years in promoting the talent reserves of the Indian subcontinent working with the immensely talented artisans from Bihar, Rajasthan, Assam and other remote corners of the country. The endeavor is to retain an umbilical connection with the huge talent resource of the country’s mysterious interiors. Working with tribals, Niki Mahajan has developed a fabric called “reeds” which is made by splitting grass and treating it with natural elements. She is also the recipient of the Yuv Ratan award for excellence in promoting the production of unique fabrics by the ministry of textiles. Niki mahajan has been working with the national award winners of various states of the country and has had the opportunity to learn all about the craft at the grass root level from them. This expertise has aided her to train a number of artisans, whereby giving impetus to their individual workmanship and the group has therefore evolved a modern school of thinking. She is specializing in trousseau, occasion wear and pret lines, with emphasis on clean cut silhouettes and intricate hand work. Niki Mahajan retails these exclusive garments from various up market stores of India and outside India. 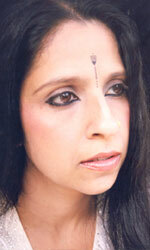 Her own studio at 27, Vasant Vihar, Priya Cinema Complex, New Delhi, houses her exclusive private collections.